There's a fine line between being creative and ridiculous, and these restaurants have passed it. I get it, competition in the foodservice is high. You need to think outside the box to attract more customers than that Turkish Kebab joint with questionable sanitary conditions around the corner. But that doesn't mean you have to serve cocktails in an umbrella. Or a chicken on a sunbathing chair. 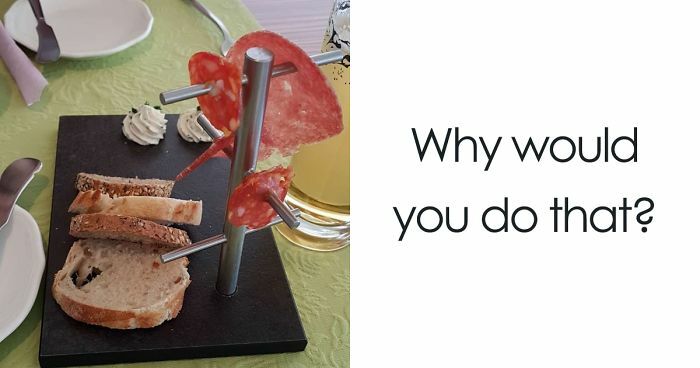 Bored Panda has already showed you the 10+ Times Restaurants Went Too Far With Food Serving but we've found so many more absurd examples, we just couldn't resist from making a successor list. Continue scrolling, check out the images and upvote your favorites! If anything, this is awesome! That's made for toilet paper rolls!!!! I have one. #4 Food Looks Delicious... But A Toolbox?! That is actually really cool is that just me? Sometimes words can't convey how you feel when you see something so stupid. This is one of those times. This looks like an art piece instead of a salad. This is a Salart. This will be a thing now. I invented Salart. I just noticed it has a head. eww. #12 Breakfast On A Tray. Am I In Jail? Nop, you aren't in jail, in India most people eat in steel plates like the one in this picture even in some local restaurants they serve good in such plates, it is perfectly normal and honestly stainless steel utensils are best! I like this one. I wonder if the box smells like cigars, that would be a plus for me. #17 I'm A Simple Man. I See An Injection, I Take My Pants Off. Why Am I Being Kicked Out? The title is hilarious tho. #18 The Tree Of... Pizza? The trolley looks so cute, someone needs to return it to the Walmice right now! #23 Why Wouldn’t I Want To Eat Caviar Off A Wooden Hand?? Can you please hand me over some Caviar, sure, there you go. #24 "Would You Like Some Bread While You Wait? ""I'm Forty-Eight Years Old"
I'm 40 and I would love this one! So you undress the dolls while you eat? If one was male it would be slightly less creepy. But still weird. Some good food theatre here. What is so bizzarre, is looking at the preivous images of a washing line of raviloli and an up-turned umbrella of cocktail, this now almost seems acceptable. What the hell is this gallery doing to me? I really love that glass. At least you know your one pound burger is exactly one pound? If I had fish goo I'd put it on the floor tile too... or on any floor the restaurant had. How.... Would you eat that? Finally, a restaurant that serves everything AND the kitchen sink! Did they wash it in the dishwasher? Why do u need 2L of milk for 2 tiny boxes of cereal?? Those are bits of leftovers from the next table. That's not yours- this one is for that pet rock. Absolutely nothing about this dish looks appealing. What would be funnier is if u had to eat it with ur hands tied behind ur back. Get the full K9 experience. Where's the burger part? The hidden brown poop inside the yellow cheesy goo? Cake is awesome...bring me all the cake!! Wanne bet they reuse the iceblock?!? Looks like chef is a part time make-up artist as well. That will be a big NO for me. #51 You Want Me To Slurp My Soup From A Wine Glass? I can see this being a legtimate effort to be slightly different. It'd be crap if they brought this to you inside a fedora. That is creative, in my opinion. what the hell is pizza oil anyhow? what a waste of plastic! I wouldn't want the bits of food to roll off the can and fall onto the sand(?) and waste the food. I hope they washed those and it doubles for toothpick too so win-win. Goddammitalltohell... don't stab the scallops! #62 Creme Brulee In A Dish Too Thin To Fit A Spoon Comfortably. Can I Just Get A Bowl? #63 Is It More ‘Alaskan’ When Served On A Piece Of Tree? This is not too bad. I could imagine it in a wintersports themed restaurant. I hope it wasn't worn. At least they are trying to stick with a common theme. Better than tacos in shoes. #70 How Am I Supposed To Pour My Bloody Custard Into This? Worker: Oh no where out of plates! Janitor: I got you covered. I'm absolutely sick of hipster food layouts...but that sandwich looks pretty good... now I want bacon...thanks a lot. Did you order a "coke" with it? Maybe they were confused? Best eat it fast, before it melts slightly and immediately falls on the table. How many do you see? I see...let me count, uno, dos, tres, cuatro, sinko!